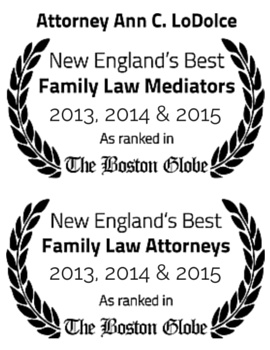 Massachusetts is an equitable distribution of property state rather than a community property state. What this means to you is that the division of property, including marital assets and debts, is not clear cut. There are a number of factors the court can consider in making the property division. Because of the uncertainty in having the court divide property among the parties, Attorney Ann LoDolce advocates a collaborative approach to property division, if possible. Attorney LoDolce has over 34 years experience negotiating an equitable distribution of property and debts, including real estate holdings, pension and retirement plans, stock options, collections, and other assets in a divorce. Classification Issues: Was the property, asset, or debt acquired prior to the marriage, and is it still discernible, i.e., can it still be identified or has it been so intertwined with marital assets or debts that it cannot be specifically identified. Attorney LoDolce is an expert at assisting men and women in property classification matters to determine whether property is marital or non marital and if marital property has been commingled. Asset Valuation Issues: How much is it worth? What date do we use for valuation purposes? What about professional practices (such as lawyers, doctors, engineers, accountants, and architects)? What about pension plans and stock options? How much are valuable collections or artwork worth? Attorney LoDolce is an expert in issues relating to the valuation of the marital estate and family residence. We work with a network of experienced professionals and appraisers, as well as actuaries, real estate brokers, and other specialists to procure a fair valuation of all marital assets and debts. We can assist you in understanding your rights, your options, and protecting your interests.